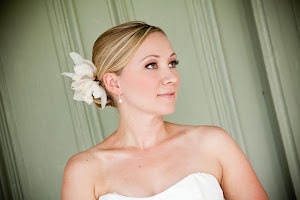 DO hire a professional hairstylist and make-up artist for your wedding day. Your wedding photography investment will be highly impacted by it. Regardless of how great your photographer is, if you don’t love how you look in your wedding photos, you will be dissatisfied. Besides that, it is one of the most important days of your life; you should look and feel especially beautiful the entire event. DO ask the potential stylist or artist to see photos of their work, their credentials, experiences, testimonials, etc., to be sure you are dealing with a professional. Pros know the tricks of the trade, are experts in their field and will deliver top quality services. DO have a hair and make-up consultation before the wedding. You should know exactly how you would look. You don’t want any surprises on that day! DO go through magazines and pick out some hair and make-up looks that you like and bring them to the consultations. DO go through magazines and pick out “must not” looks if you have any and bring them to the consultations. DO bring someone whose opinion you trust and feel comfortable with to the consultations. DO bring the headpiece and veil to the hair consult. DO have your hair and make-up consultations at least six months before the wedding. DO bring a picture and a swatch of your gown to the consultation because your bridal hair and make-up should complement it. For example, if your dress is very simple and elegant then your hair and make-up should portray simple elegance. If your gown is very voluptuous then your hair and make-up should be sensual. Your overall bridal look should be consistent! DO ask the hairstylist and make-up artist for a contract with your wedding date, appointment time, location and balance when booking their services. DO drink at least 8 glasses of water a day to help keep your skin clear. DON’T stress out! Find ways to alleviate the stress such as doing yoga, going for walks, meditation, etc. Stress wreaks havoc on the skin. DON’T get any chemical processes ten days before the wedding. That goes for the face, body and hair. You want to leave enough time to fix anything that might go wrong. DON’T drastically change your hair color or style. Remember you should look like yourself, just enhanced. DO bring touch up products such as lipstick, lip liner, lip gloss and oil blotting tissues to the wedding. That is all you will need if you have your make-up applied correctly. Everything else should last the entire event. DO self-tan before the wedding if you want a glow. Remember at least ten days before the wedding; it can always be maintained if you like how it looks. DON’T tan too much for the wedding. Being too dark compared to your natural color is not flattering. DO wear a fragrance that you love and works with your body chemistry. The fragrance is also a part of your bridal beauty. DON’T wash your hair the day of the wedding, wash it the day before. It is easier for a stylist to work with hair that is not squeaky clean. If you must wash it that day, then make sure you use extra hair product such as a mousse or a gel to give more texture to the hair. You should blow out your hair and make sure it is completely dry for the stylist unless he or she tells you otherwise. DO wear a button down or zipper shirt before you start your beauty services to avoid ruining your hair and make-up. DO surround yourself with people that help you to stay calm during your wedding day beauty preparations.